Santa Fe is home to some of the most beautiful and awe-inspiring sights and attractions in the country. The second oldest city in the U.S. garnered the nickname, The City Different, for its collection of natural, historical, and unique cultural icons. Beyond the famous adobe-style Southwestern architecture lies a city full of churches, markets, museums, and unusual attractions that set it apart from most cities. With so many points of interest in Santa Fe, New Mexico, it can be tough to tackle all of these wonderful places during your visit. We compiled this list of our 14 favorite points of interest so you can explore this magical city in the Land of Enchantment. For a complete list of the top restaurants, events, and places to see in Santa Fe request our free Vacation Guide! 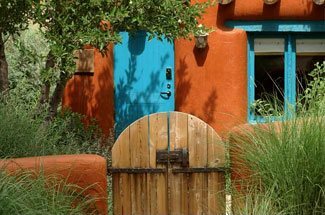 Access Your Free Santa Fe Vacation Guide! This 19th-century chapel’s main draw revolves around the gorgeous interior and mysterious staircase. Without any local carpenters or materials to build a staircase up to Loretto Chapel’s choir loft, the Sister’s of Mercy prayed to St. Joseph, Patron Saint of Carpenters, seeking guidance. On their final day of prayer, a man appeared at the chapel and built a helix staircase without any center structural supports. He left without payment or revealing his name. The Miracle Staircase is still an unsolved architectural marvel in this gorgeous church, which is now a premier wedding venue. The Palace of the Governors served as the central seat of New Mexico government for centuries. The stately building dates back to 1610, making it one of the oldest building in the United States. It now houses the New Mexico History Museum. An evening stroll under this Santa Fe icon’s adobe-style arcade is a must during your visit. Bandelier National Monument sits less than an hour west of Santa Fe and features over 33,000 acres of canyons and mesas full of glimpses into ancient civilization. Homes and communities of the Ancestral Pueblo people carved into the sides of the canyon walls dot this mind-boggling landscape. A visit to this amazing monument is a must for history buffs wanting a look into the 12th-century American Southwest. The stately Cathedral Basilica of St. Francis of Assisi lies in the heart of the city, just two blocks away from Loretto Chapel. This gorgeous Romanesque-style building almost looks out of place among the copious amounts adobe architecture, but it offers visitors a look at the seat of the Archdiocese of Santa Fe. It’s a great place to cool off on a hot day (plus it’s free). La Cieneguilla Petroglyph Site contains Puebloan art dating back to the 13th through 17th centuries. Venture 25 minutes southwest of Santa Fe to this network of trails and rock formations featuring images of hump-backed flute players and bird figures. The heart of Santa Fe’s historic district beats to the rhythm of community gatherings, local markets, concerts, and much more! Explore this 400-year old square that’s home to the Palace of the Governors and plenty of excellent dining options. The Georgia O’Keeffe Museum, dedicated to one of New Mexico’s most famous residents, celebrates her life, art, and legacy. The museum holds over 700 of O’Keeffe’s drawings and other photographs, possessions, and personal archives in nine unique galleries that highlight one of America’s most renowned artists. Check out the home of some of the Southwest’s best flavors at the Santa Fe Farmers Market. Local farmers sell everything from chiles, to honey, to crafts at this outdoor showcase near the Santa Fe Railyard Park. Get a taste of culture from around the world at the Museum of International Folk Art. Various exhibits highlighting beadwork, crafting, and other forms of artwork are the draw at this unique attraction. Learn about the history of Native American culture in the Southwest through an extensive collection of art and artifacts at the Museum of Indian Arts & Culture. A wide variety of exhibits, events, and tours allow you to dive into the rich cultural traditions of the area. The Santa Fe Opera House is worth a visit, even if you don’t attend one of the fantastic opera shows. This world-class venue features a partially open setting atop a hill north of the city that provides some of the most awe-inspiring sunsets in New Mexico. If you want a break from the heat outside, head over to Meow Wolf. This unparalleled interactive exhibit combines art, technology, and games into one of the most unique experiences in the country. Meow Wolf also holds exciting and engaging events throughout the year. Most people walk past this address without even a glance, but 109 East Palace was once the secret bus stop for scientists heading to Los Alamos National Laboratory during World War II. These scientists created the atomic bomb, making Santa Fe a part of this interesting yet dark chapter of history. The magical half-mile of Canyon Road holds fine art, shopping, and excellent dining along a beautiful and historic road. This is the perfect place to grab a souvenir to take home with you and eat some delicious local cuisine. 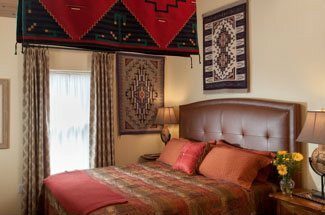 No trip to Santa Fe is complete without a stay at Four Kachinas Inn! Our luxurious guest rooms feature authentic Southwestern decor with modern accommodations. Every room comes with a full list of amenities that are second to none in the Santa Fe area. We are an easy 10-minute walk from Historic Santa Fe, giving you easy access to all of the best things to do and places to see in The City Different. Ready to start planning your Santa Fe getaway? Request access to our free Vacation Guide and get ready for the trip of a lifetime!